Last night we held a meeting entitled ‘Perspectives on Iraq’ to hear the views of several people about the current situation in Iraq. Dave Anderson MP, Joint President of the Labour Friends of Iraq and a long time official of the Trade Union, Unison, said that he had been opposed to the 2003 invasion of Iraq but had become involved in the Labour Friends of Iraq. He had accepted an invitation to visit Iraq from the Iraqi Trade Union movement who, he discovered, had welcomed the invasion as a liberation from Sadaam Hussein. He felt the most important point was to listen to the Iraqi people in how to help them solve their problems. Dave had taken Iraqis to the North East to his constituency to visit business people and to show them how the political and civil system worked. He said, “we’re a helping hand” from which Iraq can gain a lot but also we have a lot to learn from Iraq which is, after all, the cradle of civilisation. Service Project in Ivory Coast a Success! 19-26 June 2008 - A joint venture by Service for Peace International and the Special Task Force Europe Volunteer Programme to rehabilitate a primary school in Amanvi, Tanda located in the Ivory Coast proved to be an enormous success. Volunteers gained invaluble experiences while contributing to the small community of the Ivory Coast nation. 9 July 2008 - The British Academy for World Peace, in partnership with UPF, held a book launch and special presentation by Professor Lord Bhikhu Parekh in London. Lord Parekh laid out the context of the dialogue between Muslims and the indigenous European community by looking at the stages of immigration and the resulting pressures these brought. The Student Peace-Building Corps is an international movement of student leaders working in cooperation to build peace at all levels. Its members, known as Collegiate Ambassadors for Peace, represent the religious, racial and ethnic diversity of the human family that stand on the common ground of shared principles and are committed to the path of promoting reconciliation, overcoming barriers, and building peace. 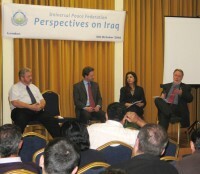 13 May 2008 - The Universal Peace Federation’s London headquarters played host to some sixty people who had come to attend the first in a series of interfaith initiative events which are planned to take place across London and beyond in the near future. 19th July - 2nd August 2008, Czech Republic - WAIT is a proactive educational project that shows the benefits of abstinence until marriage. Further training for teams to be able to present its central message took place this summer in Zbraslavice in the Czech Republic.